As featured in the NY Times, Gothamist, and AM NY, and for the past 6 years we've been NYC's best and only Comedy and Pole Dancing show. 5 comics and 5 dancers alternate the stage to create a show that makes everyone happy. Comics tell jokes. Pole dancers pole dance. They’re not strippers, it’s not burlesque. It’s aerial dance with a side of crazy gymnastics and death defying tricks that make your jaw drop. 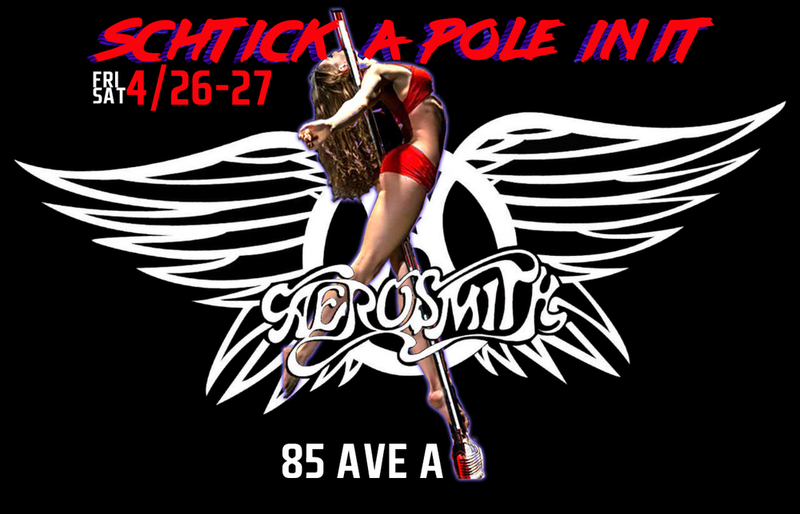 If you never seen a pole show this is the one to come to. Every month we have a musical theme and this month it's Aerosmith. Are we Crazy or just Livin' On The Edge? You will be Cryin' if you don't Walk This Way down to Schtick this month. If you don't see shows like this why are you even paying these crazy rents.